Return to bike commuting: What to wear? BikeCommuters.com > Articles > Return to bike commuting: What to wear? What to wear while riding your bike to work is mostly an individual choice based on weather, style and practicality. On my next installment I will address hygiene, the #1 reason (in my opinion) why people are reluctant to ride a bike to work. I actually like wearing cotton T’s for commuting. I’m also with you on the mtb shorts, I dig my HOSS Mtb Knickers. My, my…that’s quite a lineup of gear! One thing to remember, though, is that no special clothing is required to commute — ride slow and “come as you are”! What every American bicycle blog fails to point out is that for many people, bicycle-specific clothing may be unnecessary. For my 4-mile commute, I almost always wear just my office clothes. In the winter, I just add a scarf and/or a raincoat. In the summer, I swap cargo shorts for my office pants. This is practical for people with shorter distance commutes and reasonable climates. I know for a fact that you scare people curious to get into bicycle commuting when you present a long list of bike shop apparel. It makes it seem like one has to make a huge wardrobe investment before giving bicycle commuting a try. @Murali, I almost always wear my work clothes, too…that’s why I pointed out the “come as you are” in the comment right above yours. I wish I could ride to work on my work clothes, even with the electric assisted bike I break a sweat! I also work in an office environment, so I can’t get away with jeans and a t-shirt. Riding in your work clothes is a huge bonus to cycling in the winter around here! Once the jet stream finally tips over and we start getting the SW wind, however, you had better be riding in shorts and a spare shirt no matter how slowly you go. Even with the reality of the coastal NC summers I still refuse to buy “special” clothes to commute in. Jeans and a T-shirt year ’round. In winter, I add wool socks, hiking boots, long johns, a fleece layer and a shell that is a regular 3 way jacket. Plus a good balaclava and mountaineering mitts for those -30 to -40 mornings here in Winnipeg. Lately, I’ve come around to wearing more “normal” clothes on the bike. If it’s cold, I’ll add a layer of tights under my pants. I do change shirts when I get to the office as my commute is around 8 miles. Shorts if it’s hot out. I’ve also switched to wearing wool as much as I can. I find that wool Ts and long sleeved shirts (terramar, smartwool, icebreaker, ibex, whatever) provide far better thermoregulation, are far more comfy and stink way less than the synthetics I used to use. If you don’t mind shopping around and can wear last year’s style, you can find some decent deals on the stuff. Finally, I switched to wearing regular clothes for philosophical reasons. I think that when people see someone on a bike and they’re wearing technicolor specialized clothing it just raises another barrier to entry for them. These days the only bike specific clothing I wear is a helmet and gloves, basic safety stuff. I ride an Xtracycle with albatross bars which gives me an upright (and damn comfy, I might add) position, and I have flat pedals with regular shoes. In other words, the message I try to send people is that if you have a bike, get on and ride. You can do it. Yes to wool. Anything wool. On my 8+ mile uphill ride into work in the morning, it is impossible to ride sedately enough to not break into a heavy sweat. Of course, I live in Phoenix, Arizona, where the temperature in August at 10 PM at night is STILL over 100°F! Cotton T’s one size larger than I normally wear are just the ticket; for bottoms I wear either MTB shorts or cargo shorts. Dude, seriously lose the cotton t’s. You might think you’re helping yourself by riding in a larger size, but you’re really not. You really want to get some wicking shirts like the Rec Tech or Under Armor type (there are plenty of inexpensive options) Wicking refers to the property of the fabric that pulls (wicks) moisture away from the skin. This is a property found in treated synthetic and microfiber materials because they do not absorb moisture like cotton. Wicking is important when doing physical activity that causes sweating. As everyone knows, sweat is your body’s attempt to cool itself. When you sweat and it evaporates from your skin- your body is cooled. Wicking fabric facilitates that by pulling the moisture from your skin and then releasing it for evaporation. When you wear clothes that do not act in this manner, like cotton, that moisture is absorbed by your clothes and held next to your skin, (or in your case in a layer just off the skin that prevents airflow) it doesn’t evaporate quickly. This reduces the cooling affect and also encourages bacterial and fungal growth. So wicking fabric is important because it helps cool your body when it needs cooling. It’s important even for those of us in areas that experience cold weather. While you might feel fine working up a sweat in the cold- if your clothing keeps the moisture in contact with skin, as soon as you stop moving, you will begin to get cold- in a bad way. Having said all that, wool is also an excellent hygroscopic material that acts in much the same way though it tends to be more costly. @ Dave Lloyd. The wicking shirts I ride in look pretty much like any other normal t-shirt. I even wear them to other casual events during the summer – you’d never confuse me with someone “in training” wearing the stereotypical Lancie-boy kit. I look like a “Regular Joe” + a helmet, gloves and a plain black messenger bag. I wear lycra knickers or tights with wool jerseys in the winter. When summer comes it’s lycra shorts and lightweight synthetic wicking jerseys. Way too hot in the summer here even for MTB shorts. How about a safety yellow toga? 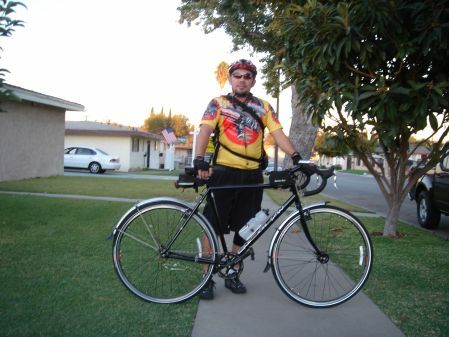 I’ve said before and will again, I own a few sets of bike specific clothing, mostly bought for charity rides, and I mostly wear them to commute. Winter inner layers are typically UnderArmor thermals, and outer layers are sweats that I don’t care about. Spring/summer are bike specific, or light workout clothes. I don’t do my (10 hilly miles) commute in jeans because they do make it harder, and I don’t ride in work slacks becuase I got sick of getting grease and road grime on them. I don’t ride in my work shirts because I will sweat, and because I can jump out of bed, onto the bike and then shower at work. Funny thing, what you wear doesn’t matter. I think most of us would recommend having something for visibility either on clothing or on the bike, but beyond that wear what works for you, what’s comfortable, what simplifies your transition from bike to office, what looks good if that matters to you. Personally I don’t think seeing commuters in bicycle specific clothing is a turn off for newbies. Criminy, it’s not like there are bike police riding around busting riders for not adhering to the dress code. Folks know they can wear whatever they like. I’m assuming they already wear whatever they like during their “civilian” lives, why would being on the bike be any different? Noobs don’t need their hands held quite as much as we seasoned riders think they do. The southwest deserts of southern Arizona are DEFINITELY “very warm environments.” If your clothing wicks the protective layer of moisture away from your skin, your system attempts to compensate by tapping into the reservoirs of moisture in your other tissues. Short of an IV tube, there is NO way of getting enough water back into your system to offset the drain (pun unintended). When your tissues get low on water, you proceed rapidly from heat exhaustion to heat stroke … to death. Whenever I’m up north, in the mountains, where it rains and snows, you are absolutely correct. I have just one word for THAT environment: wool. I did some research on your specific situation a bit more and apparently the hiking crowd there is right there with you. I suppose it’s because it’s SO dry there, but I admit that I still can’t get my head completely around it. The human body regulates it’s temperature through the evaporation of sweat. Cotton shirt holds sweat (at ambient temperature) preventing the very evaporation expected for cooling as well as the airflow needed for the same. I suppose it’s because in the middle of the desert evaporation comes so quickly that the sweat is gone before it actually can help so the cotton delay might actually help. As for the rest of us who live where plants grow 😉 my previous statement stands with the caveat of proper hydration. My experiences have taught me that I’m far more comfortable wearing wicking fabrics during the hotter months that I am in a sopping wet stinking t-shirt. Then again I haven’t been through the desert on a horse with no name either. @BluesCat — you’ve got to remember that Raiyn and I live in a climate where you can literally wring moisture out of the air — summertime temps in the 90s with 80%, 90%, even 100% humidity. Cotton KILLS here, but otherwise I agree with you…it’s not the “evil fabric” that so many outdoor enthusiasts claim and definitely has its place in the active wardrobe. In our climate, even the wicking fabrics can be incredibly uncomfortable…I’ve ridden many a time here in Florida with sythetic jerseys and once they reach their saturation point, it’s like wearing a damp plastic bag. Not pleasant! I’ve lived in several areas MN, TX (North and South), S. Carolina and I can honestly say that I’d reach for a wicking shirt in any of them for riding or summer time activities. @Raiyn — well, me too, but I just wanted to point out that cotton isn’t the boogeyman like a lot of people think. I’ve been known to rock a cotton t-shirt from time to time as well, but definitely prefer the synthetics for most of my riding. Raiyn: Oh yeah, I’ve been in some places in the Southeastern U.S. where I discovered mold in my shoes in the morning. Any clothing and shoes which will wick would definitely be what I would wear there. Now you know why the Middle Eastern folks wear those ankle-length thwab garments of cotton: they form your own personal “tent” which keeps moisture close to body rather than losing it to the environment. @ Ghost Cotton’s not the boogy man particularly in the nice temps we’re having right now, but come summer it stops being an option for me for riding or outdoor social activities. Am I still allowed to call myself a bike commuter if I ride in jeans and a souvenir Cape Cod hoodie instead of all that brand-name stuff? I live in Florida, too (Tampa Bay), and vary my gear between a cotton t-shirt and a wicking shirt. In my short 3.5 mile ride, I still manage to get quite sweaty by the time I get to work. Don’t know what the fashion folks say about safety green shirts, but those are my cotton shirts and they really help people see me. If I can find the wicking shirts in safety green I’d buy them. For those that aren’t familiar Tampa is the name of the city. Tampa Bay is the body of water that lends it’s name to our local sports teams. The region surrounding the body of water is also referred to as the (Tampa) Bay Area. $13 and they’re out of stock on a few sizes at the moment I type this, but the next lowest price is $19 on Amazon. Prices range from 10.99 to $14 or so for wicking, safety green and reflective shirts. Awesome!